This tribute to the brilliant Butch Morris, who passed away earlier this year, features two of his closest friends and musical colleagues – Wayne Horvitz (Seattle) and JA Deane (New Mexico) – using the conduction techniques developed and pioneered by Morris with the Royal Room Collective Music Ensemble. Employing an elaborate repertoire of hand signals, Horvitz and Deane guide the musicians through spontaneous compositions in which the musicians control the content while the conductors control the form and structure. Lawrence D. “Butch” Morris (1947-2013) was a composer and trumpet/cornet player known for developing the concept of “conduction,” a method of using elaborate hand signals to guide diverse ensembles of improvising performers through large-form works that draw on the spontaneous elements of group improvisation while retaining the formal logic and structure of composition. Morris was hugely influential, working with musicians from many countries, cultures, and musical styles. Some of the artists who worked with him went on to form their own conduction ensembles based on his techniques. Butch Morris documentary. Italian interview + vocal performance. NY Times obituary. Wayne Horvitz is a composer, pianist, and electronic musician, and a co-founder of the Royal Room in Columbia City. He has performed extensively throughout Europe, Asia, Australia, and North America with a wide range of collaborators: Bill Frisell, Butch Morris, John Zorn, Robin Holcomb, Fred Frith, Julian Priester, Philip Wilson, Michael Shrieve, Bobby Previte, Marty Ehrlich, Skerik, William Parker, Ron Miles, Sara Schoenbeck, Peggy Lee, Steven Bernstein, Briggan Krauss, and Dylan van der Schyff, among many others. Some recent projects include JOE HILL: 16 Actions for Chamber Orchestra, Voices and Improviser, and These Hills of Glory for string quartet and improviser. Ensembles include The President, Pigpen, Zony Mash, The HMP Trio, The New York Composers Orchestra, The 4 Plus 1 Ensemble, Sweeter Than the Day and The Gravitas Quartet. JA Deane (“Dino”) is a multi-instrumentalist, sound-designer, and conductor now living in rural New Mexico. As a trombonist he has played with everyone from Ike & Tina Turner to Jon Hassell and Brian Eno. He became a close collaborator in Butch Morris’ real-time composition creations called Conductions and in 1995 co-produced Morris’s epic 10 CD box set Testament for New World Records. Deane has an extensive background in composition for modern dance having created over fifty dance/music works with dancer/choreographer Colleen Mulvihill. He has an equally long history creating sound design for dramatic theater, working with Sam Shepard, Julie Hebert, and Theater Grottesco. Inspired by his experience with Butch Morris, Dino formed the conduction ensemble Out of Context, which he has led in New Mexico since 1997. 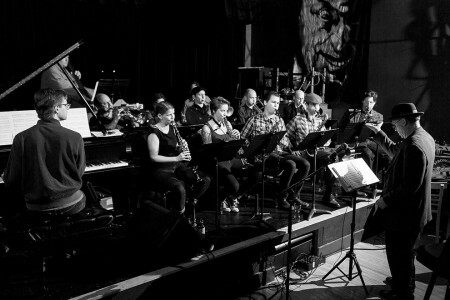 The Royal Room Collective Music Ensemble is a 15-20 piece band featuring some of Seattle’s finest and most innovative improvisers under the direction of composer Wayne Horvitz. Tonight’s members include Ivan Arteaga, Sam Boshnack, Ryan Burns, Chris Credit, Eric Eagle, Beth Fleenor, Craig Flory, Geoff Harper, Jacob Herring, Al Keith, Steve O’Brien, Christian Pincock, Naomi Siegel, and Jacob Zimmerman.